When big retailers order huge shipments of clothing made overseas, the bills from transportation companies are often riddled with costly errors—mistakes they may never find. Steven Ferreira, founder and CEO of Ocean Audit, has broken $1 million in a business he runs from a coworking space in Greater Hartford, Ct., by doing the detective work to find these mistakes and helping the retailers get refunds. Last year, his best one to date, the father of three says he hit $1.7 million in annual revenue and turned a profit. Under Ferreira's business model, his firm keeps 50% of the money he recoups for each client. Ocean Audit's business model is similar to that of medical negotiation firms, where experts in medical coding help patients identify overcharges on medical bills and get medical providers to fix the mistakes, in exchange for a percentage of the money saved. Because few people have the expertise to both uncover the errors and negotiate with the companies doing the billing successfully, these types of businesses can be very lucrative for people who know the ins and outs of a particular industry. Ferreira is one of a growing number of solo entrepreneurs who are building million-dollar, one-person businesses. In 2016, the U.S. Census Bureau found there were 36,161 nonemployer firms bringing in $1 million to $2.49 million in revenue; 2,074 generating $2.5 million to $4.99 million and 316 bringing in $5 million or more. The number of nonemployer firms bringing in $1-2.49 million, the largest revenue category above $1 million, is up 35.2% from 26,744 in 2011. While some of the owners have broken $1 million by coming up with brand new products, many, like Ferreira, are doing so in professional services and B2B firms, finding gaps in the marketplace in the industry where they already work. Here’s how he pulled it off. (He's also sharing his story at a free community event I am moderating on the one-person business on Wednesday, Oct. 24, in Brooklyn, N.Y., where six other owners of businesses that broke the seven-figure mark will be speaking.). Tap your professional knowledge base. Ferreira spent a good part of his career in the shipping industry before he decided to start a business. He worked at an international container shipping business, United States Lines, after graduating from Providence College in 1982. “I was able to learn the intricacies of the operational side and the problem areas,” he recalls. He eventually moved to China to work as director of pricing for Sealand, a major shipping company, from 1987 to 1989, then found himself living in Seattle following a corporate relocation in 1989. One thing Ferrreira learned during those years was how many billing errors there were in the industry. “There are so many mistakes in ocean shipping, I saw it would be a great thing to help customers,” he says. He decided to start a business helping B2B customers identify errors that were leading to their being overcharged. Ferreira encountered skepticism from those around him. One friend, who had years of experience in their industry, told him flat out, “I don’t think you’ll make a dime.” His father, usually a great supporter, worried about the risks of starting the business and encouraged him to stick with the world of traditional jobs, steady paychecks and health insurance, as he’d done as a beloved school janitor. But Ferreira yearned for a different lifestyle—and something compelled him to stick with his idea. By 1994, Ferreira started his first business, TradeChek, a company that did ocean freight auditing in the container shipping industry. He dove into starting the business, scouring publicly available data on the cargo the ships carried over to identify the errors, then go to the retailers and offer to identify and rectify the overcharges, in exchange for a percentage of the cash he helped them recover. He enjoyed the detective work involved. “I think what I love is the chase,” he says. Auditing ocean shipping bills was both an art and a science, he found. The art entailed knowing how to approach the top executives at big companies and let them know they missed a giant billing error—something that might not sit well with members of the financial team who had not noticed the mistakes. To smooth any ruffled feathers, he played up his skills in forensic auditing, something internal financial professionals weren’t expected to have. “I know like a surgeon how to diagnose a problem,” he says. Work Ferreira had done in sales in the past, where he needed to work with top executives at big companies, also helped on this front. “I’m not shy,” he says. The science of auditing shipping bills emerged from knowing his industry well enough to find errors that generalists in the freight auditing field—who might cater to trucking, air freight and rail freight, too—tend to miss. As soon as Ferreira found his first customers, a small company from Japan, he realized he was on the right track. “I found a $500 refund in the first 15 minutes,” he recalls. That billing error would ultimately prove to be small compared to the six-figure mistakes he sometimes finds now. Rather than charge by the hour, he made a decision that would be critical to achieving high revenue: He would base his fees on the refund secured for his client. “When they get their refund of $100,000, I get $50,000,” he says. Ferreira built the company gradually, winning one customer at a time and learning the approaches that worked best as he went along. He gradually won clients such as Walmart, Kmart, Sears, Gap and the U.S. General Services Administration. His pricing model helped him build revenue quickly. The Seattle-area firm was successful enough for him to sell it to a publicly-traded company, Profit Recovery Group in Atlanta, where he worked as vice president from 1997 to 2001. Keep improving on what’s working. Once he sold his first company, Ferreira, who was living in Redmond, Washington at the time, used the money from the sale of his business to pursue a long-held dream: to become a professional golfer. Although he played every day for three years and had a number of colorful adventures, including being chased by a grizzly, it didn’t work out the way he planned, given how competitive the sport is. “A lot of the proceeds went to golf greens around the world,” he recalls. It reminded him of some of the reasons he’d loved the field in the first place: It was an ideal fit for his unique skill sets and had high barriers to entry for others. By 2004, he started Ocean Audit, which he calls a “2.0” version of his audit company, in a Regus office in Prague. Make the most of digital resources. 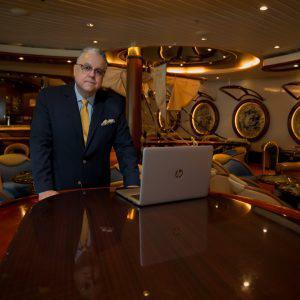 By the time Ferreira started Ocean Audit, certain aspects of his business were much easier than the first time around. Ferreira was able to get data from a ship’s manifest—a document that lists its cargo—through an online site called Panjiva. He was able to hire a developer to help him automate the searching his does through public documents to identify errors, greatly improving his efficiency. He could hire virtual assistants through sites like Upwork to help him reach out to executives at big retail companies via LinkedIn. And he found a high-end freelance copywriter to craft elaborate “drip” email campaigns to reach his targets. By 2017, after gradually building revenue year by year, he broke $1 million, hitting $1.7 million. What pushed him to that level, he says, was winning several big accounts last year. “I gained three of the top 10 global automakers. That container volume put me over the top.” He currently works with 14 Fortune 100 companies and 25 of the top 100 importers in the country by container volume, he says. Ferreira could retire soon, but he has no desire. He loves what he’s doing too much. “At 57, I feel I can do anything,” he says.